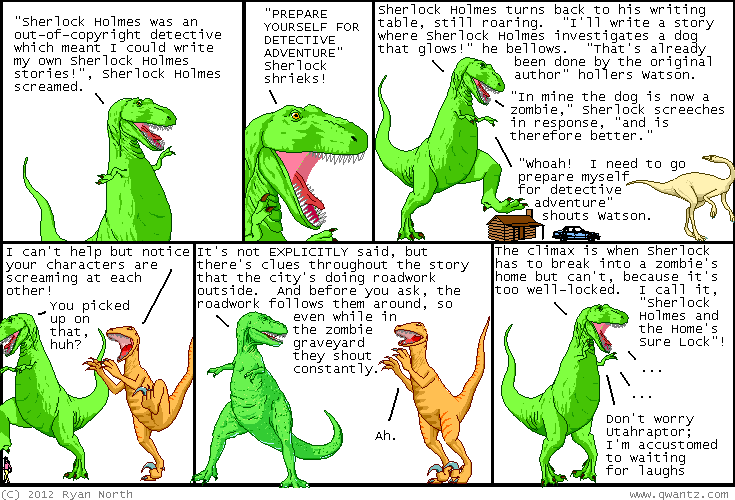 Dinosaur Comics - January 20th, 2012 - awesome fun times! –If you don't have any trains around, that is!! January 20th, 2012: Remember yesterday, when I mentioned the amazing "Sherlock Holmes Unlocks The Secrets of Effective High-Performance MySQL Database Administration"? I got a few emails saying "holy crap I would read that book" (so would I!) and then Bredon sends me... THIS. Anyway long story short I'm pretty sure I wrote it in the future and sent it through time to be published back in 1983. I bought it and when it arrives I'll let you know what secrets I'm going to / already have left there for myself!